This video is made of images taken by NASA’s Opportunity rover between November 4th and 5th, 2010. A few of the frames are enhanced or simulated to give the movie a better flow, but this is as close to a real Martian sunset as human eyes will see for at least a generation. And it looks nothing like a sunset does on Earth. On Earth, incoming sunlight is scattered in all directions by the gases and particles in our atmosphere. The blue light is scattered more than other colors because it travels on a shorter wavelength, so we see a blue sky. When the Sun is low on the horizon around sunrise or sunset, the sunlight is passing through more atmosphere to your eyes. This means more of the blue light is scattered, allowing some of the longer wavelength blue and yellow hues to escape and reach your eyes, accounting for the amazing array of warm colors. The same thing happens on Mars, but because the atmospheric composition is different, light scatters differently to give the Martian sky its characteristic red hue. The dusty particles and gases in Mars’ carbon dioxide-rich atmosphere scatter the sunlight reaching the planet such that the blue light is almost completely eliminated and the longer, reddish wavelengths survive to be seen. 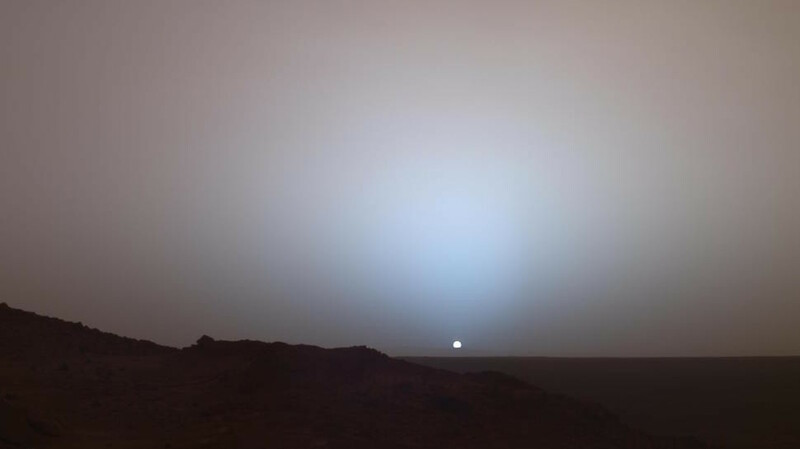 Just like a sunset on Earth, the sunsets on Mars pass sunlight through more atmosphere, scattering light such that some blue light survives, making for a blue sunset. And because the Martian atmosphere is so much thinner than the Earth’s — Mars’ atmosphere is only about one percent as thick at the Earth’s — we don’t see the scattering sunset light diffusing through the sky as much. The blue light stays much closer to the Sun. Opportunity landed on Mars in 2004 and was designed to last just 90 Sols (90 Martian days). Lucky for us Earthbound humans it’s still working more than a decade later, capturing vistas we would never otherwise see.